Industrial scenes and landscapes by artists based in Newlyn and St. Ives, Cornwall, at the turn of the 20th century, are displayed here from the 26th of January to the 14th April. The gallery itself is non-profit and showcases art from UK regional collections. Christopher Wood, Cornwall Rising, (1930). Works by artists such as Stanhope Forbes (a favourite of mine) and Harold Harvey depict Cornish traditions and personalities. Among the exhibits are Forbes’ A Fish Sale on a Cornish Beach. Stanhope Forbes, A Fish Sale on a Cornish Beach, (1885). “For a painter aged 27, as yet of no reputation, A Fish Sale is an ambitious and complex painting, far beyond the technical ability of any painter of that age now. It is casually classical in composition, as though The School of Athens, painted by Raphael when he too was 27, lurks in suppressed memory. 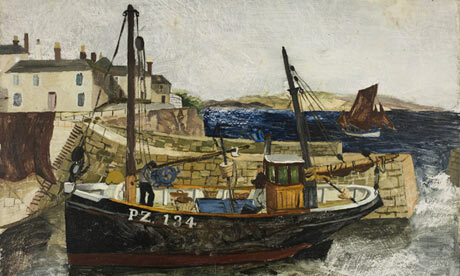 These works allow the viewer to experience ‘working Cornwall’ and the many facets of its communities. I love Cornish culture and the people are so vibrant. After studying Cornish art for part of my degree, I am excited to see such works displayed for the public. These works combine themes such as the industrial, the rural, working people, and the environment but they also reveal the geography of place through narrative and the historical. 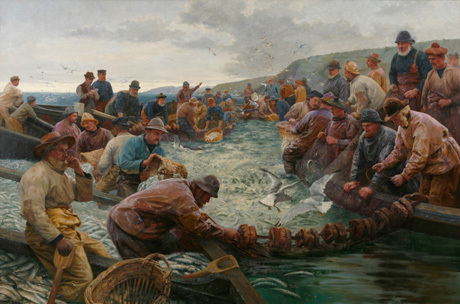 Percy Robert Craft, Tucking a School of Pilchards – The Tuck Boat, (1897). The works are drawn from the Royal Cornwall Museum in Truro, as well as private collections and show a variety of Cornish life which is definitely worth exploring. After spending most of my life travelling to Cornwall, I feel a great affinity with these works, and they make me long for the sea.